Sometimes, if you overcook the butternut squash, the noodles break apart into little pieces. Sure, it’s frustrating. Ya, it doesn’t look totally like pasta. But ya know what? It still tastes good! 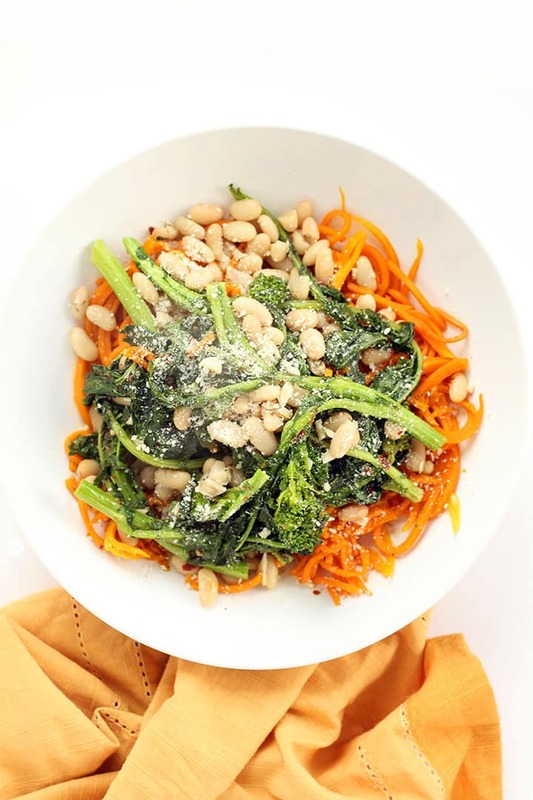 Today on “how not to photograph spiralized pasta,” we have butternut squash noodles under a mound of quick-simmered white beans and garlicky broccoli rabe. Note to self for the future: the noodles are the stars, let them shine! Yes, I slightly overcooked the butternut squash noodles so when I poured the white bean and broccoli rabe on top, they broke apart into little pieces. While this didn’t make for pretty photos, it didn’t affect the savory, fall flavors of this dish. Broccoli rabe has a sharp bitterness to it, but when you sautee it with lots of garlic, red pepper flakes and some olive oil, the bitterness fades. Then, when you pair it with the sweetness of the butternut squash and the soft velvet textures of the salty parmesan cheese, all you can think about is shoveling more of it into your mouth and you forget about the aforementioned bitterness. But really, if you don’t like bitter, blanch the broccoli rabe for just a minute in boiling water to remove some of that sharpness and then continue with the recipe. I could crunch on broccoli rabe all day, every day. 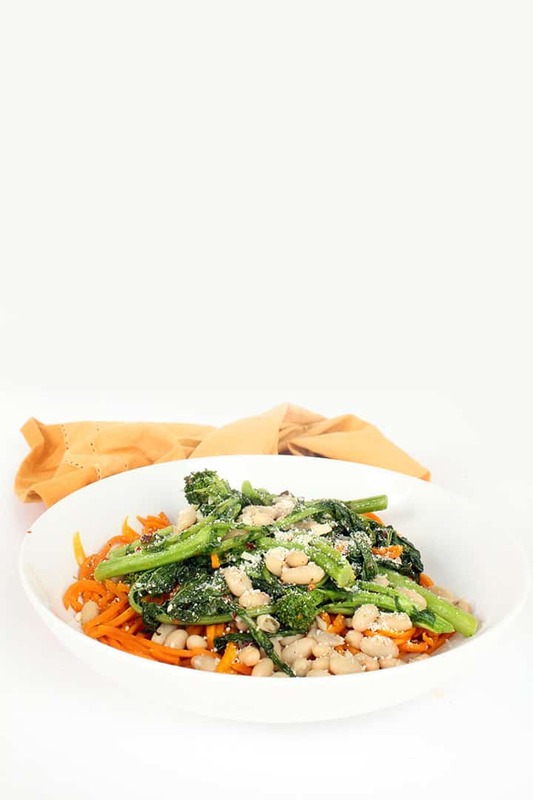 It’s got such a distinct nutty flavor that can’t be beat – not even broccolini can touch it. My grandfather makes the best broccoli rabe – it’s bitter, garlickly and spicy, just how it should be. If you can handle the heat, add an extra pinch of red pepper flakes to this recipe. I’ve made it here with white beans and a warm chicken broth seasoned with oregano, which complements the butternut squash and adds flavor without adding heavy calories and fat. Alright, I’m off to send in another edited version of my manuscript – I have such exciting news to share with you regarding my cookbook that I could burst! Patience, Ali, patience. Have a healthy Monday – see you tomorrow. What are your favorite ways to eat broccoli rabe? Preheat the oven to 400 degrees. Place the butternut squash noodles on a baking sheet and coat with cooking spray. Season with salt and pepper and bake for 8-10 minutes or until al dente. When done, divide noodles into bowls and set aside. While the butternut squash is cooking, place a large skillet over medium heat and add in the olive oil. Once oil heats, add in the garlic, red pepper flakes and broccoli rabe. Season with salt and pepper and cook for 3-5 minutes, tossing occasionally, or until broccoli rabe is wilted. You can do this in batches. Once the broccoli rabe is cooked, pour the chicken broth into the skillet and add the beans and oregano. Let cook for 5-10 minutes or until liquid is reduced by half. Remove the skillet from the heat, stir in the parmesan cheese and toss to combine. 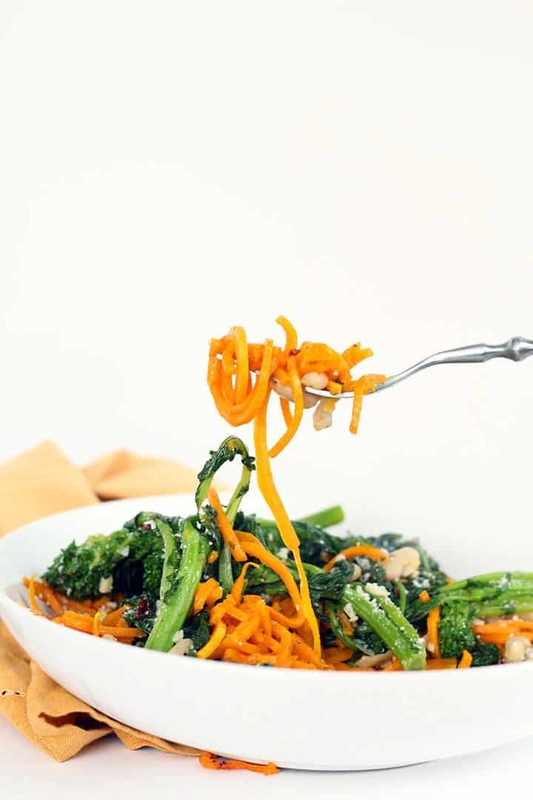 Divide the broccoli rabe mixture equally over the bowls of butternut squash noodles. Serve immediately. How did you cut the butternut squash to spiralize it? Did you take the seeds out? You can find a tutorial on how to spiralize butternut squash on my YouTube page! Link in the "Videos" section (youtube.com/getinspiralized). This is such a great idea!!! Fall noodles -- who can resist? This looks like a great recipe. I'll have to try it. I know I'm a nitpicker, but you can't really categorize this as vegetarian if you are adding chicken broth. The vegetarians in the house would need some type of veggie broth. Hi Ali, Just want to let you know that even if broccoli rabe is more closely related to turnips than to broccoli, they are all in the in the same family: the mustard family (Cruciferae). That family includes kohlrabi, cabbage, Brussels sprouts, collards, kale, mustard, horseradish, radishes, cauliflower, water cress, rapeseed (better known as canola)… That aside, this recipe sounds very good. I like the flavor combination and the fact that it combines all the carbs we need into one dish. Just popping in to say that I just made this subbing in broccoli crowns that had been in fridge and added in some cooked, shredded chicken. It is delish! Fabulous! I can't say enough about how great this dish turned out. As I live in a house with men, I garnished the dish with duck proscuitto. A solid ten!!! Thanks. Great recipe! I'm wondering how this holds up if I want to bring this for lunch the next day. Can I put it into the microwave for a few minutes without it completely becoming super mushy? I made it tonight for dinner. It was so good. The combination of the sweetness of the butternut squash and the bitter Broccoli Rabe along with the canellini beans was absolutely delicious. I ate two servings and can't wait to have it tomorrow. 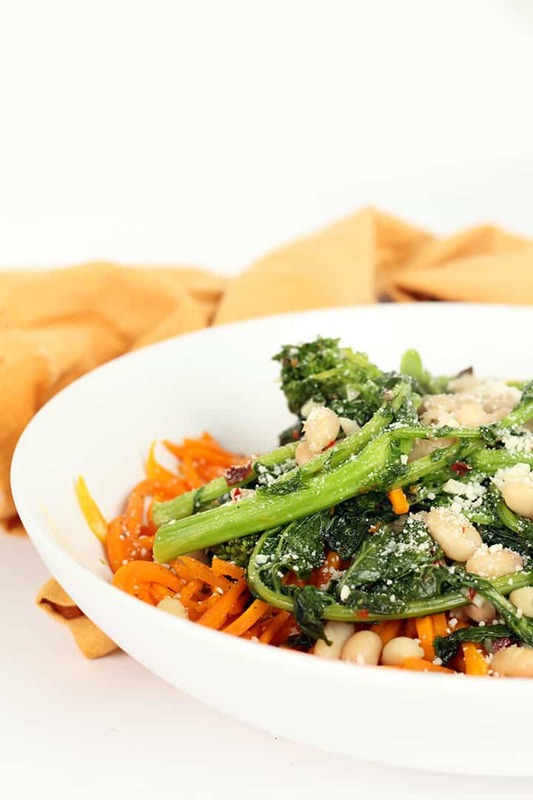 I love brocolli rabe and beans so this recipe caught my eye. I'm not a vegetarian, so I decided to brown some Italian sausage and add it to the dish at the end with the cheese. Delicious! I had to stop myself from eating most of it in one sitting.